In 1839, only two years after Michigan had joined the Union, Wayne County paid $800 to buy a 160-acre farm in Nankin Township (now Westland). The purchase included a log cabin known as the Black Horse Tavern. The County erected an addition to the tavern building and used it to house 35 needy people, a keeper and his wife. They called it the Wayne County Poorhouse. Its first residents were transferred from another poorhouse at Gratiot and Mt. Elliott in Detroit . Many refused to move, claiming the new poorhouse was "too far out in the wilderness." And they were right -- at that time the corner of Michigan and Merriman was nearly two days by stage coach from Detroit. But that was what the county officials had in mind. They wanted somewhere well out of sight to send what they saw as society's dregs -- the vagrants, vagabonds, drunkards, pilferers and brawlers. With such a broad charter, it wasn't long before the feeble-minded and the insane were being housed there. Records show that a Biddy Hughes was Eloise's first official mental patient, committed by her family in 1841. She was in her mid-30s when admitted and was kept there until her death 58 years later. Prior to the 1840s, little distinction was made between rational and mentally ill inmates. A county report from the 1840s made reference to harsh restraints used to separate the mentally ill from other inmates. The mentally ill were housed on the upper floor of a farm building used to keep pigs. County employee Stanislas M. Keenan reported in his 1913 book, "The History of Eloise," that in the first few years people in the surrounding area heard "the chained unfortunates roaring and shrieking in discord with the squealing pigs beneath." Conditions improved in 1869 when the mentally ill were moved to a new building where they were supervised by a neighboring farmer and his wife. But the chains remained until 1881, when Dr. E.O. Bennett, Eloise's first medical superintendent, did away with them. In 1894 the Wayne County Poorhouse got a new name. Freeman B. Dickerson, president of the county board overseeing care of the poor, renamed the facility Eloise, after his 5-year-old daughter. The county eventually split the facility into the Eloise Infirmary for the Sick and Elderly and the Eloise Hospital for the Insane. In 1903, after a sharp increase in tuberculosis cases, it was recommended that these patients be separated from the general hospital population. A canvass hospital was erected consisting of two tents -- one for males and one for females. As the number of TB patients increased Eloise Sanitarium was built. In a report to the auditors in 1911, a Dr. Dutlitz says, "The erection of this hospital was an answer to the public call." He said physicians were practically unanimous in recommending open air treatment for tuberculosis of the lungs. The patients at Eloise posed a special problem, however. By the time they got to Eloise they were in the final stages of the disease. They were sent there from other treatment centers when their personal funds were exhausted, leaving them candidates for the poorhouse. Eloise continued to operate what was essentially a TB hospital for indigents until 1923, when the State and City of Detroit began providing facilities. In the 1930's Wayne County began feeling the effects of the Depression. Eloise grew rapidly as both the indigent and mentally ill populations multiplied. In 1932, a barracks was erected to house unemployed men. By 1934 the inmate population averaged more than 8,300, about 50 percent of them mentally ill, and the number of employees had risen to nearly 2,000. For residents, boredom was a major problem. A 1939 Detroit News article described the daily routine: "The residents rise at 7 a.m. and go to bed at 7:30 p.m. Between times, they sit and stare at the wall, at their feet, at the windows. There is no exercise or organized social movement." Some inmates received passes to leave the grounds where they became easy targets for policemen, who arrested and fined them for petty crimes. Most found the outside world difficult to cope with. Many spent their leaves at local bars and ended up in jail. Others walked the surrounding neighborhoods aimlessly..
Eloise grew into a city unto itself. Its 78 buildings included a fire department, 15-man police force, powerhouses, a cannery, bakery and fruit cellar, a sewage disposal plant a morgue, laundry facilities; a library and low-rent employee lodgings. Nearly 20 percent of the staff lived on the grounds. In 1945, Eloise was renamed Wayne County General Hospital and Infirmary. The new name was intended to reflect the modern "scientific" approaches to caring for the poor and mentally ill that had been institued at the facility. Most, however, continued to refer to the facility as Eloise. By the 1950's Wayne County General was considered one of the best hospitals in the nation. It played a major part in metro Detroit's health network. 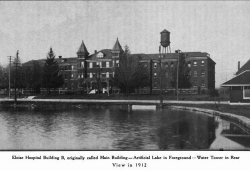 It was the only acute-care medical and surgical hospital between Detroit and Ypsilanti. Needy patients would have died without Wayne County General. A reporter who toured the facility in 1953 was moved by the "pitiful cases" -- "the senile, the spastics, the polio victims and those with advanced multiple sclerosis." By the '50s, patients were benefiting from insulin and electric shock therapy, psychotherapy by psychiatrists and occupational and recreational therapy. Occupational therapy included farming, sewing, work in the hospital laundry and maintenance departments. Recreational therapy included classes in handiwork and a special division of music therapy. Throughout its boom years, when the complex was caring for as many as 10,000 patients daily, the facility was plagued by reports of patient beatings, employee theft, mismanagement, unsanitary conditions and overcrowding. At one time 3,800 mental patients -- including 300 with tuberculosis -- were crammed into quarters designed for 2,500. As many as 125 women had to share five toilets. By 1955 money problems had become acute. George E. Gullen Jr., chairman of the Wayne County chapter of the Michigan Society of Mental Health, figured that on a per patient basis, Wayne General was "the most expensive mental hospital in the world." The county continually sought ways to cut costs. One auditor questioned the practice of buying false teeth at $100 a set for indigent TB patients, after noting that $6,500 had been spent on dentures in one six-month period. Not all was bleak at Eloise. A carnival was held each summer on the hospital grounds with booths built by patients. Patients also ran a coffee shop in the psychiatric building. "They must face life and its stresses and we want them ready to do that," explained one of the doctors. Proceeds were used to buy recreational supplies. By 1960 new theories for treatment of the mentally ill were developing, and Eloise kept in step. The goal was no longer to provide long term care, but to return patients to society as soon as possible. Most were kept less than 90 days and in 1964 only one in ten became permanent residents -- compared to nearly 50 percent previously. This success added to Eloise's money problems. The state chipped in for psychiatric expenses only after patients had been hospitalized for a year. Wayne County also began "mainstreaming" -- getting the psychiatric patient back into the community each week. This sometimes caused problems. One patient was so excited about his weekend leave that he stole a car from the hospital parking lot. There was a high speed chase in which he was involved in five collisions and ran two police blockades. During the chase shots were fired, nearly missing a group of children at a school crossing. The inmate was taken into custody after running the car into a ditch. As patient treatment was updated , so were the facilities. Older buildings were razed in the '60s and '70s and two new buildings were constructed -- a 511-bed medical hospital in 1962 and a long term care facility in 1974. The Walter Reuther Long Term Care Facility housed the surviving mentally ill and poor who had made Eloise their permanent home. By 1987, six years after the facility's closing, Eloise had been reduced to eight buildings. Today, only a 5 buildings remain and all are empty. The county is currently working on a plan to redevelop the complex. The "D" building houses some Wayne County of In November 2015, the Detroit Free Press reported that the 50-acre complex was put on sale for $1.5 million – which includes an fire station from the 1800s, a decommissioned power plant and two maintenance buildings. On March 29th, 2016 the former bakery building built in 1905, one of the last original buildings, was the victim of arson. The damage was enough to have the structure demolished. Morgan Development purchased the property in June of 2018. There are 3 cemeteries that were used from the 1890s through the late 1940s. The number of burials is somewhere between 7,000 & 8,000 and they are marked with a headstone that has a number on it. This page was last edited on 22 February 2019, at 14:03.